AOR™ guarantees that all ingredients have been declared on the label. Contains no wheat, gluten, nuts, peanuts, sesame seeds, sulphites, mustard, soy, dairy, eggs, fish, or shellfish. 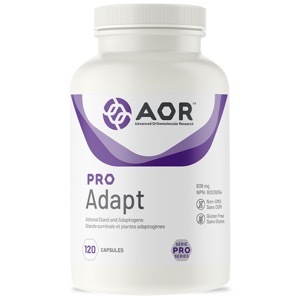 AOR's Pro Adapt contains a carefully formulated blend of vitamins, nutrients and herbs with adaptogenic properties. These include: pantethine, an active coenzyme form of vitamin B5; well-known botanicals such as rhodiola, ashwagandha (Withania somnifera), licorice (Glycyrrhiza glabra), and siberian “ginseng” (Eleutherococcus senticosus); vitamin C, and adrenal glandulars. Pro Adapt is designed to help the body deal with stress more effectively, stimulating the adrenal glands, while helping to prevent adrenal insufficiency, manage stress, combat fatigue, and improve hormone regulation. It also provides exogenous adrenal stimulation from glandulars, nutrients, and cofactors to assist in endogenous adrenal function, depleted by stress. Pro Adapt provides therapeutic doses and potencies of each ingredient, combining orthomolecular nutrition with time-tested glandulars and clinically proven herbs. To eliminate any risk of bovine spongiform encephalopathy (BSE), adrenal glandulars are porcine-sourced. Adult Dosage: Take 2-4 capsules daily after a meal. Caution in use beyond 1 month. Caution: Consult a health care practitioner prior to use if you are taking antidepressant medications, hormone replacement therapy (HRT) or birth control pills, if you have any type of acute infection, liver disorder or if you are pregnant or breastfeeding. Consult a health care practitioner if symptoms persist or worsen. Headaches, mild gastrointestinal disturbances (such as nausea), heart palpitations, or hyperactivity/insomnia may occur. Consuming ashwagandha with alcohol, other drugs or natural health products with sedative properties is not recommended. Do not use if you are taking thiazide diuretics, cardiac glycosides, corticosteroids, stimulant laxatives or other medications which may aggravate electrolyte imbalance, or if you have hypokalemia, high blood pressure, a kidney or cardiovascular disorder or bipolar spectrum disorder.